Shortly after the release of The Moon Sisters on March 4th, Heather Schmitt-Gonzalez, founder of a foodie blog called girlichef, reviewed my book. The review is not only one of my favorites, it also includes something truly unique: a recipe created by Heather and inspired by The Moon Sisters. Heather has graciously allowed me to recreate her review and recipe here, for all to enjoy. Please do check out Heather's website, girlichef, which is an absolute feast for both the eyes and the stomach. You can also follow Heather on Facebook and Twitter, and read the Sunday Supper Movement Online Community Magazine, where Heather is the acting Editor. It's easy to spot a foodie by the way they write. Therese Walsh is definitely a foodie. 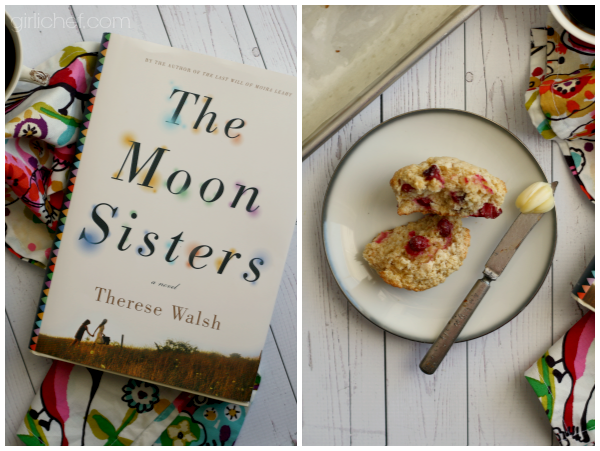 The Moon Sisters is a novel about family bonds and dynamics, dealing with grief, and finding acceptance (within yourself), but it's also laced with two of my favorite things mystical forces and food. Lots and lots of food. The Moon sisters, Jazz and Olivia, are as different as can be. Jazz is the older and more stoic one of the two, with a penchant for writing stories and poetry (especially haikus - a girl after my own heart). Olivia, the spirited younger sister was born with Synesthesia, which gives her the ability to see sounds, smell sights, and taste words. It's tough enough being the older sister (says the oldest of four siblings), but having to deal with Liv's "eccentricities" and unique way of looking at life has taken its toll on Jazz through the years. After the death of their mother, the magnetic force in the family, they are forced together on an unexpected journey. A journey that after many twists, hops, and turns, brings them closer and helps them understand each other, by becoming better acquainted with themselves. A cast of colorful characters (one quite literally) round out their lives and their adventures. And you know I cannot resist relaying some of the amazing food that made an appearance throughout the book: pancakes, huckleberry corncakes, lobster drowned in butter, grilled pb&j, pepperoni rolls, pierogi, pizza, Buffalo Burger with Cilantro Mayo, Lemon Meringue Pie, Fish & Beans, Herbed Eggs over Greens, Ham on Hearty Rye drizzled with mustard...and garlicky, buttery, lemony mushroom soup. What I think were the two most important foods in the book...the ones that were subtley referenced from beginning to end...were BISCUITS and CRANBERRIES. Babka owns a bakery, in which she supplies their small village with the best (perhaps only) freshly baked biscuits and other Slovakian baked goods around. From the old Biscuit Bus that Jazz inherited, the biscuits that sustain them, to the way their parents met - I knew I'd be making biscuits. The biscuits represent comfort, home, family, and tradition. And the cranberries. Well, throughout their whole life, their mother was working on a book that was set in a cranberry bog. In order to finish that book, she needed to visit the bog and soak up the magic that lies within. Olivia's decision to bring her mother's ashes to the bog is the sparks that lights the fire behind both girls. The cranberries represent the magic, the tartness and sometimes unwelcome things in life, the unexpected. 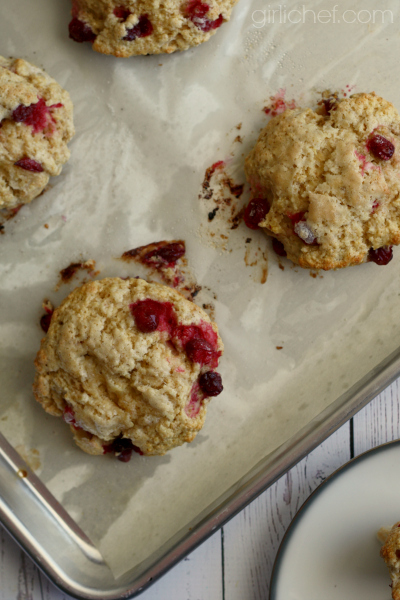 The warm, knowing, sustainable biscuits are complemented perfectly by the vibrant, messy, colorful bursts of cranberry. Both are delicious in their own right, but even better when they come together. Kind of like the sisters themselves. Whisk together flours, sugar, baking powder, salt, and lemon zest in a large bowl. Using your hands, rub the butter into the flour mixture, squeezing with your fingers until you are left with very small, flour-coated pebbles. Make a well in the center and add the buttermilk and egg, use your finger to break the yolk and beat lightly before working in the dry ingredients. Dough should look somewhat dry and craggly. 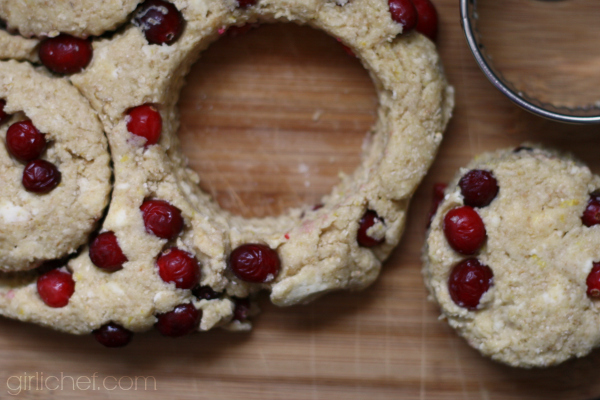 Add cranberries, then turn out onto work surface and quickly pull the dough together into a rough mass. Press together and turn over a few times, but be careful not to overwork the dough, as it will lose its tenderness. Brush the top of the dough with the egg wash and sprinkle with a good coat of sugar. Slide into preheated oven and bake for 14 minutes, until they are just kissed with gold. Transfer to a wire rack to cool slightly.